What can I say, it's been a fast summer. I need to thank my clients for their patience. This year has been a bumpy ride and I've been doing my best to give 100%. Still I know I've dropped the ball here and there. I make things right but I'm mostly so, so very LUCKY to have the clients I have. They been cutting me slack and cheering me along. This season has been my busiest yet and while I'm not physically doing much work at 55 North Main, I'm consumed wit ideas, plans, decisions and discussions. The old me would DREAD this sort of change. And some days I do wish that I could just garden for a living or work at an antique store that someone else is responsible for. But this week in particular I'm starting to feel excitement. Now, if I could just commit to a few paint colors . . . It's almost time! First Birthday invite for a little guy. Printed on recycled card stock with a matching kraft envelope. LOOVE her colors. 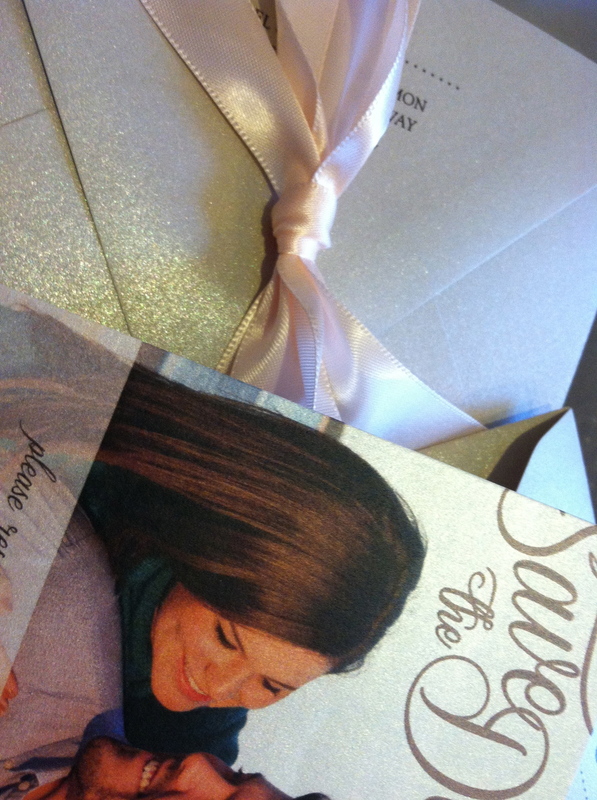 Soft pinkish coral tones with a shimmery sand envelope. The photo is printed on a quartz shimmer card and it looks fabulous. I can't wait to see what this gal has in her head for her invites. Okay, I'm loving this extra special touch of having a custom liner. Found a new supplier that allows me to purchase 5 yard samples. I'm having fun ordering colors. They always look a bit different in real life. This vintage ribbon is soft and the muted colors work so well with everything. When the store opens I'll have custom notepads while you wait. Tied with a special ribbon and the addition of a cute pen and you've got a fun gift that works for many occasions. New binding combs come in bronze and steel. This was a fun job. A client wanted a special sign for her daughters bathroom. She purchased a super cute from from Hobby Lobby. She brought in the paint chip and asked me to design a simple phrase. Then she requested I mirror the design before i printed. I had to test it. Now her young daughter will see this affirmation as she is getting ready in the morning. What a nice mom! I have to give Adam major props. Because of his determination (and a patience I didn't know he could muster) the building is nearly ready for paint. This wasn't all that long ago. It's looking better now. The window air conditioner is temporary. It can get pretty stuffy in this old place. It wasn't easy. Sitting on a bucket doesn't sound like a fun or comfortable time. BTW, Adam informed me that the last strip of paint near the bottom is my responsibility. That is my punishment for being short. This was found etched into a brick. It's centered below the largest front window. Anyone have an idea who CL might be?